The basic workflow to create a mapped BAM (Binary alignment/Map) file is shown below. The links to the left contain more detailed information for specific steps. Firstly lets consider a miRNA sequence tag, where the insert (i.e. the miRNA) is 22nt. This means that the sequence in the output file will be a chimeric of both the miRNA sequence plus the 3' adapter (highlighted in A of figure). Therefore we cannot map the map the entire output sequence against the reference as the adapter will not map. 1) identify and trim off the adaptor. 2) Align a short fragment (eg 18nt) of insert against reference and then extend the alignment as far as possible. After removing the adaptor the output modified sequence file will only contain insert sequences (highlighted in C of figure). These insert sequences are mapped to the reference using a program called an aligner (highlighted in D of figure). The final output (highlighted in E of figure) is a sequence alignment map file (SAM) which can be converted into a binary equivalent (i.e. BAM file). The 3' adaptor sequence is very likely to be present in the sequencing data files, and if not removed will cause significant alignment problems to the reference. Therefore correctly identifying the adaptor and removing it will significantly enhance the mappability of the data set. There are a large number of software available to do this task, the bioscholar web site has collated a thorough list of such tools. Below is an example on how to use the cutadapt software. The above example will remove the 3' illumina adaptor. The "-m 18" option will discards all sequences having a length less than 18nt (after adapter removal). There are a number of software aligner tools available to make a BAM file. If you have access to a high performance computer setup you will most likely utilise the aligner via the command line. Below are two popular aligners used to map small RNA libraries and examples of the command line syntax. Please note there are various parameters not listed below that may be more suitable for your project, therefore consider this a quick start guide to get you up and running. Please refer to the linked home pages for each aligner for detailed instructions on their use. Before using BOWTIE aligner you need to build a reference index using the "bowtie-build" program. where:  reference.fa is your reference sequence in fasta format. ref_index is the output name for the index file. Below is an example of a bowtie command that takes a fastq data set ("seqfile.fastq") and aligns it against a reference index ("ref_index") and outputs the result in sam format. This example then pipes ("|") the sam output into samtools which converts it into bam format into the file "out.bam". example is allowing 1 mismatch in the first 21 nucleotides. --chunkmbs       is the amount of memory set aside to help in assigning best location. Note that for multimapping miRNAs this results in a random assignment of mapped locations. If you want to assign multimappers to all locations then add "-k 100" to the above command line options. This will assign up to 100 valid alignments. Note that doing this will result in multimappers being present in the final miRspring document and will distort the seed analysis tools. Note the samtools command receives the SAM output from the bowtie command and converts into BAM format. Note if you are mapping colour space data must add the -C flag to specify this. Alternatively you can use the above mentioned aligners via the GALAXY web based analysis tool box. List of publications on NGS aligners. Biowulf list of programs,packages and databases. There are basically two reference choices for miRNA mapping, whole genome or miRbase. There are cetain benefits of using one or the other. Of these two references miRBase is a considerably smaller and requires less computing resources to align sequence files. Additionally there is considerably less multimapping. The downside is that it is possible for a sequence tag to map to a miRbase entry even if it aligns better to another genome coordinate. Another downside is that miRbase precursor entries contain the predicted stem loop sequence. It is possible that the stem loop structure extends further than what is incorporated in miRBase and processed miRNA from these regions (eg MOR miRNAs) will not be reported in the BAM file. Conversly using the genome will require more computing resources and possibly resulting in false negative mapping events. For example A miRNA sequence tag containing an error/editing event may map to a different part of the genome. It is also possible that a multi-mapping sequence may not be reported (especially if aligner settings not set correctly). However the benefits is that you can potentially discover new miRNAs that are not annotated in miRbase. Implementation note: miRspring relies on the BAM header to define what is in the reference. Therefore if you decide to align to miRBase make sure the reference file is in fasta format and that each sequence header has a precursor naming convention (i.e. species code - miR - number). The sequence header names in the fasta file must match the names of the miRBase files used by miRspring. Note: the output file will append a ".bam" to the end of the given filename. TCreate an index for a bam file. You need to state the name of the index file, and recommend that you use the exact same input name but add a ".bai" at the end. Aligning short sequences to a reference is a bioinformatic challenge. While the quality of sequencing is continuously improving there is still a good chance that a significant number of sequence reads will contain an sequencing error. There is always a delicate balance in trying to recover more information without incorporating to much noise. Additionally modifying the accepted length and mismatches will increase the number of multimappers and therefore accuracy and computing resources. MISMATCHES: If you are interested in identifying RNA editing events or non-templated additions you will need to accept mismatches in your data set. MiRspring is designed to display mismatches but will not discriminate between sequencing errors and RNA editing/modification events. Note that the miRspring pipeline identifies mismatches through the NM tag in the BAM file. The exact mismatch position is then identified by comparing the sequence against the reference. Therefore to correctly identify the mismatch position the sequence tag of a BAM file must have a non-masked tag-sequence field. (i.e. no masking of sequences with 'N'). Please refer to the FAQ if you are having troubles with this feature. LENGTH: The miRspring document is primarily designed for miRNA sequences. The biggest challenge in aligning these short sequences is the ability to uniquely map a miRNA. Sequences that align to multiple locations are problematic in identifying the transcriptional genomic point of origin. Sequences that map/align more than one time are referred to as a multimappers and consume more computer resources. Supplementary Figure 1 of Cloonan et al paper highlights the mulitmapping issue of short sequences. Many popular aligners provide options to limit the computing resources devoted to multimappers. For example you can set parameters to not consider sequences that map more than 3 times (and these would then be considered unmapped). Given that miRNA sequences are short it is worth considering a number of entries will result in multimapping. While the miRspring document can display sequences of any length up to 35nt you should be aware of the problematic nature of correctly mapping short sequences. We recommended not to mapped sequence tags shorter than 18nt. Remember the average length of a mature miRNA is 22nt. 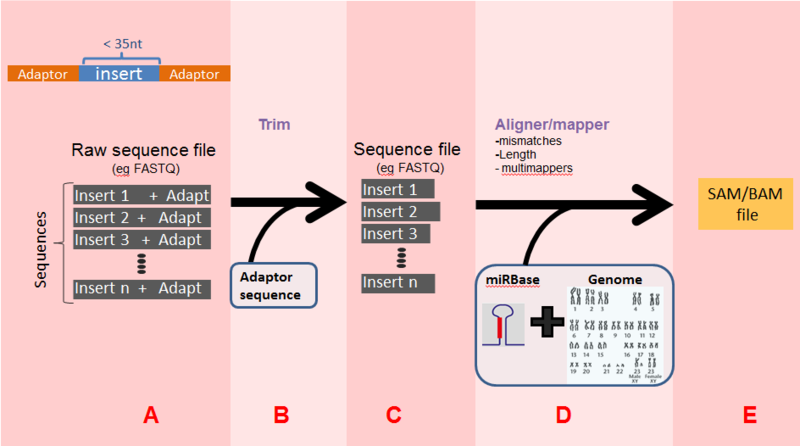 Multimappers: A number of entries in miRbase are known to occur at multiple loci. It is wise to be familiar with the miRbase naming convention as this will indicate which miRNAs are likely to multimap. As a rough guide and miRNA with three "-" in the precursor name is a candidate eg	hsa-miR-133a-1. The BAM file specification allows a lot of information about the experiment to be stored in the header. While it is not essential to have this information included it is highly recommended to include it. The miRspring document displays any information stored in the header fields when the "description" button is selected. You do not need your own data sets to use the miRspring pipeline as there are a large resource of BAM files provided by the ENCODE project. Please note that while you can access very recent data sets there a strict time limit imposed on using recent data sets for publications (9 months). Also please be aware of the ENCODE data policy. --nomaqround     No rounding of the Phred score to the nearest 10. --chunkmbs 		 is the amount of memory set aside to help in assigning best location.